Back in February I did a roundup of 10 Perfect Crochet Squares for Fast Afghans, and that post was a real hit! 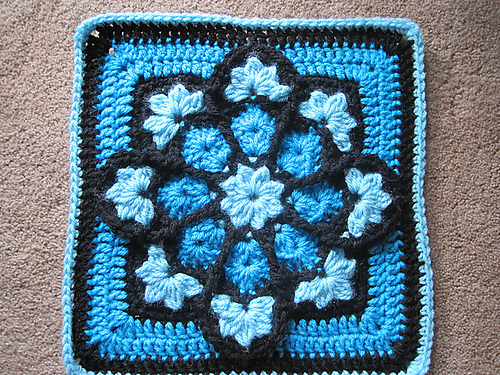 It detailed some of the squares I used to make a large blanket, as part of a crochet along I did on Ravelry. It’s been a couple of years since I made that blanket, and the surprisingly cool temps lately have me dreaming of another one. But it’s not just the weather – it’s all the beautiful new afghan square patterns coming out! Here are 10 of the hottest and newest free afghan squares right now. UPDATE 9/10/2013: 3 of these patterns are no longer free – sorry for any inconvenience! It’s always a surprise when a pattern suddenly switches to paid. Fireworks Surprise by Amy Schwab (9 inches) – NO LONGER FREE.This one is a free Ravelry download, and it is just fantastic! I love the use of color and stitches, and even the reverse looks great! She recommends using anywhere from two to eight colors per square. 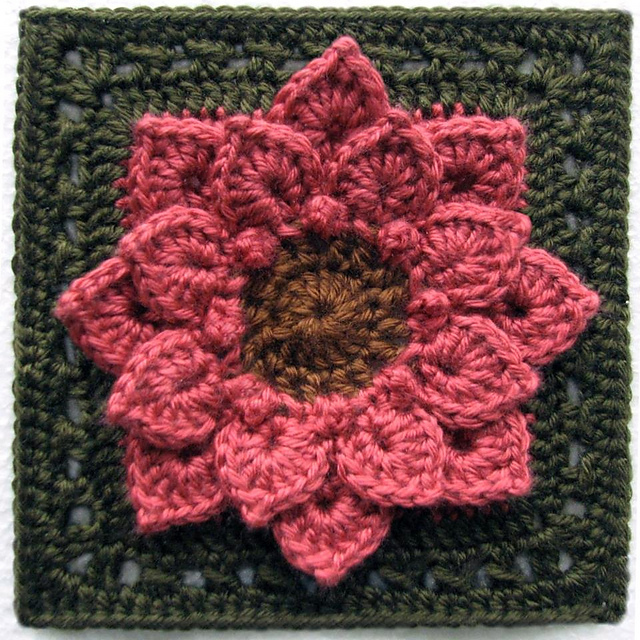 Crocodile Stitch Afghan Block – Dahlia by Joyce Lewis (6-7.25 inches) – This one is another Ravelry download, and it puts the wildly popular crocodile stitch to good use as the petals of a dahlia flower. So pretty! Be sure to check the gallery for all the color variations used with this one. JulieAnny’s Stained Glass Afghan Square by Julie Yeager (12 inches) – NO LONGER FREE This one is yet another Ravelry download, and has had me excited ever since the first time I saw it. I just love it! Every color combo I’ve seen since has been just gorgeous. 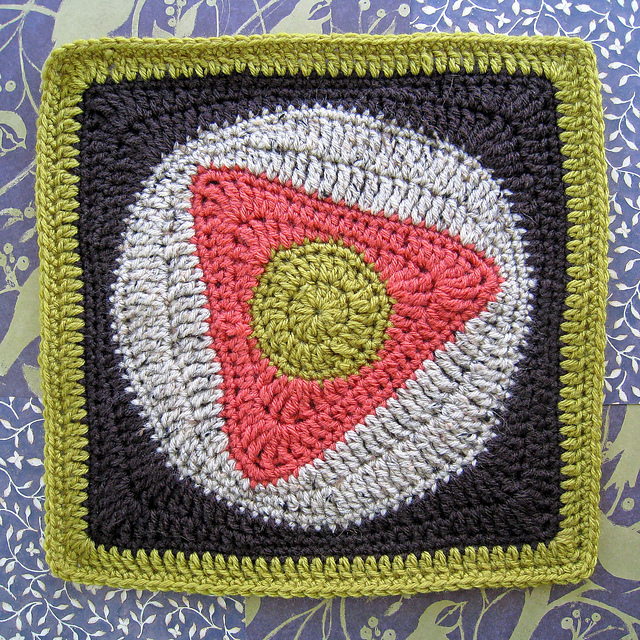 More V’s Please – 12″ square by Melinda Miller (12 inches) – This square is free through Ravelry as well, and while it looks lovely in just one or two colors, I think this version really shows it off. It’s rated as Intermediate Beginner, but if you have any trouble there’s an entire forum hosted by the designer where you can get all the help you need. 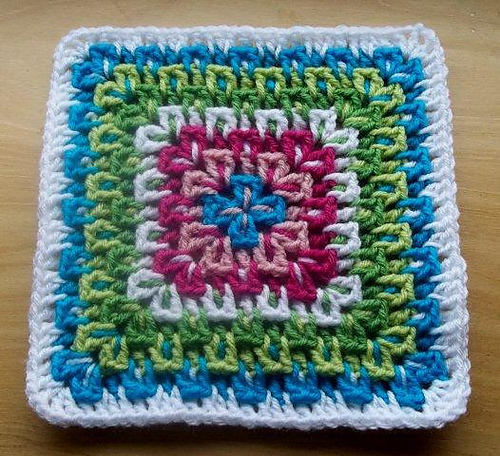 Yarn Clouds Square by Amelia Beebe (12 inches) – This free pattern is available on the Crochetville boards. It’s another one that looks great plain, but I guess I’m in the mood for color, because this version by Raveler craftyminx is calling my name! It’s very light and pretty in these colors, and makes me feel so happy. Squaring the Big Circle by Kate Jenks (size varies) – This pattern on Signed With an Owl is written up as a photo tutorial, which makes it super easy to create your own granny square circle block. From the ones I looked at in the Ravelry gallery, people were getting anywhere from 7 to 12 inches on these, so yarn choice and gauge will make a big difference. Porthole Square by Colour in a Simple Life (unknown, but I estimate about 4-6 inches) – NO LONGER FREE – This is a new pattern, out just this past month, and I think it’s brilliant. It’s absolutely perfect for highlighting little bits of color, or showcasing bits of your favorite fabric. She uses US crochet terms and lots of photos to make it easy to follow along. 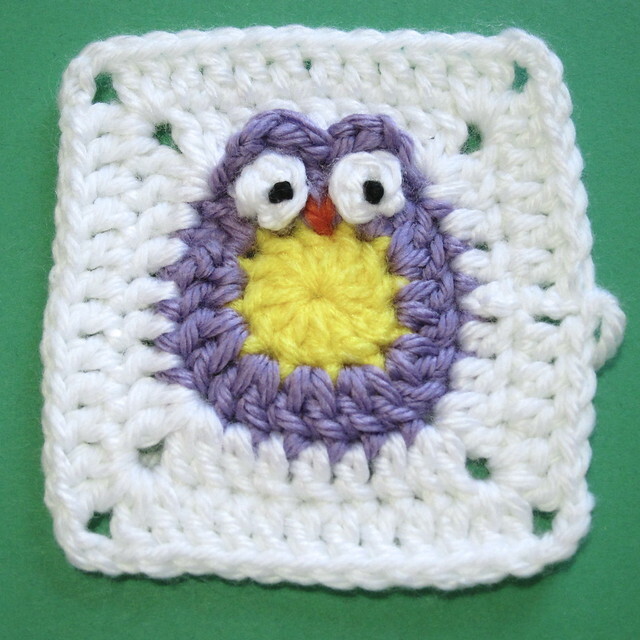 Owl Granny Square by Kat Lewinski (4 inches) – The owl might just be the bird of the decade! 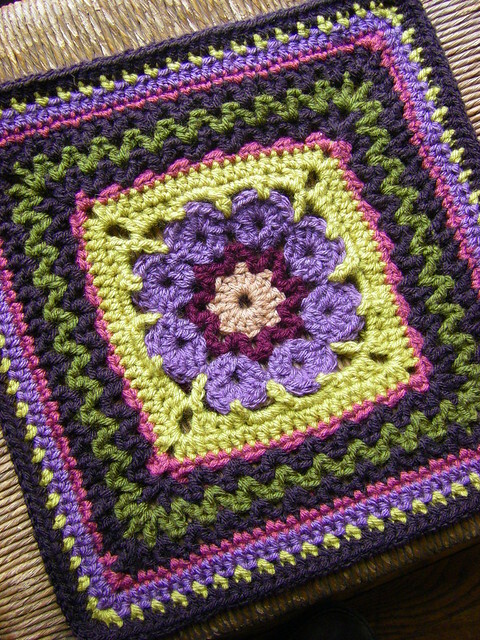 It’s so cute and wise and still very much on trend – just like granny squares! This free pattern on Just Craft Enough features step by step photos and directions to make your own owly blankie – great for a baby shower or any owl fan. Granny Bobble Spiral by Colour in a Simple Life (custom) – NO LONGER FREE Bobbles AND spirals?! How could I resist including this pattern? Just as in #7, she’s put together a fantastic tutorial with step by step instructions. It looks like she stops around 8-12 inches, but I think this tutorial would work very well with any custom size you like. 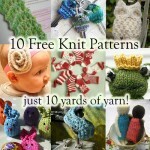 I hope you’ve enjoyed this latest free pattern roundup – which one is your favorite? What other things are you hoping to see in a roundup? Let me know in the comments! 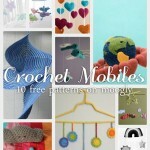 Crochet Mobiles – 10 Free Patterns to Dress Up Any Room! 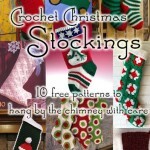 Crochet Christmas Stockings: 10 Free Patterns to Hang This Year! Thanks for saying so Sarah! Thanks for linking to my square, I’m flattered! I’ve seen a lot of these beautiful squares on Ravelry but have yet to try them… Great round up of squares, makes me want to go grab my hook and try some! Thanks for sharing the pattern Kate! It’s fantastic! I know what you mean Linda – I love them all! 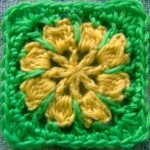 i just love love your site & just getting back into crocheting – your website is truely inspring! i’m attempting the “yarn cloud square” and trying to make it smaller. i’ve completed round 3 (light pink in your picture) and i’d like to skip the rest of the “clouds” and go to the border (light blue). i’m having a heck of a time trying to figure out which round i should jump to and would appreciate it if you could direct me? thanks so much for all the wonderful ideas! Thanks so much diane! And you’re very welcome! As far as I can tell that would be Round 10, though it might be easier to do Round 9 first as that looks to be a transition row. wow – thanks for the quick reply! i was guessing #10 . . . and i’ll try it from #9.
i think i should have picked another one to attempt . . . as back posts get me twisted in knots! i was thinking of cheating & turning for row #9 – as front post stitches seem more natural . . . or maybe i should just follow the rules/pattern! thanks, again for your help . . . off to hook! 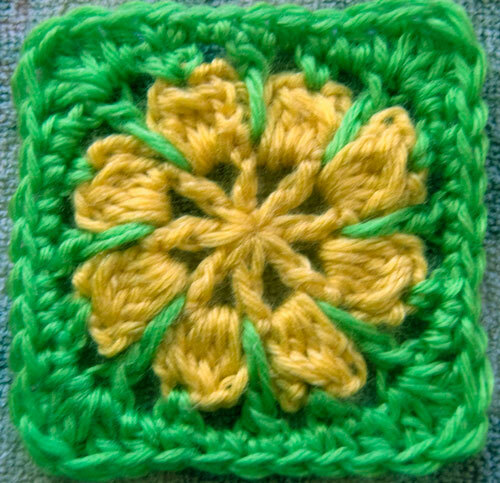 oops – should have added that what i’m trying to attempt to do is to make a square either 3″ or 5″ to incorporate into an iphone case – hence the reason for omitting rows! lol – i need tons of refreshers & thanks for the link. just wanted to update you . . . the next morning i realized i had forgotten one of my critical approaches = KISS, which made me realize the cloud square was way over my head! so i found a few simple granny squares and am working those up into iphone cases. i’m having a great time incorporating all your wonderful stitches in the connecting portion of the case! 😀 I hear ya! I had a BRILLIANT idea the other day… that totally didn’t work lol. Happens to all of us! Wow,thanks for all beautiful patterns. lik e everything i see.want to try all of them. 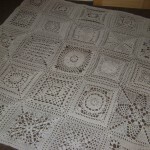 how can i get patterns for the granny squares? Thanks for all the useful free patterns. I can see a bunch of afghans for gifts in the future for my family lol. I got away from crocheting for a few years and this just makes me want to get going on a couple of projects. I just have to share this too. These squares are fabulous !! I really like the stained glass square and the bobble spiral are just 2 of my Fav’s but they would all make a gorgeous afghan !! I been wanting to make a square a day blanket and these are just perfect !! Thanks for sharing !! Thank you! Some lovely patterns. What a bummer! Thanks for letting me know BD! Oh you’re welcome. I know it’s not your fault! 🙂 I appreciate so much you sharing your beautiful creation and giving us such great ideas! Love your versions. Just thought I’d let you know #7 is no longer free either. It requires you subscribe (yearly) to her site. Ah shoot, thanks for letting me know Tonya! Ah, shoot, looks like she has indeed moved it. Thank you for letting me know Jo! Hello! Thank you for your site that makes you want to rush on his hook and wool balls.